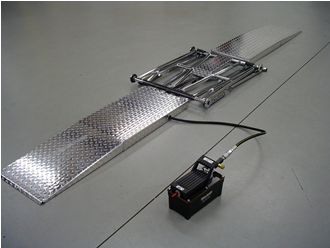 Hawaya Racing Products recently contacted Projack about building a totally new type of bike lift. After several months of design and testing, here is the result. The perfect bike lift. The Projack bike lift is a work of art. We had 3 main goals in mind that we wanted to accomplish in developing this new lift. First, was for it to be first class and of the highest quality. Second, was to make it compact enough to be easily stored and light enough to be shippable via regular ground UPS or FedEx. Third and most important to us, was to be able to remove the oil pan and service the lower end of our race engines without removing the bike from the lift, or having to carry additional stands to support the motorcycle. The Projack lift incorporates a safety bar that secures and locks the lift into the raised position. The complete hydraulic system can be removed andthe bike is securely locked into position. Notice all of the room under the front of the bike to access the lower end. MISSION ACCOMPLISHED! Gday Hawaya Racing, just wondering how much the new Projack bike lifts are and delivered to Perth Western Australia.